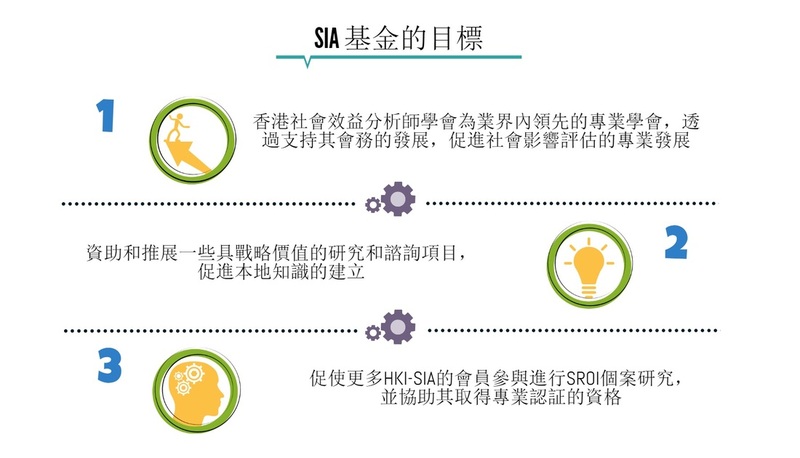 With generous donations from the RS Group and the Xu Family Charitable Foundation, HKI-SIA launched the Social Impact Assessment Project Fund (SIA Fund) to accelerate the development of the professional discipline of social value accounting and impact evaluation in Hong Kong, Mainland China and the nearby region. In essence, the SIA Fund provides seed funding to support the development of HKI-SIA in its early start-up stage. Fund disbursements however would be tied in with research and consultancy projects that serve strategic purposes in catalyzing the development of professional practices. 1. Exploratory Re﻿search on We﻿llbeing Valuation: Pioneered in the UK, wellbeing valuation is a methodology with a high level of rigor that could assist a wide range of social service operators to monetize their social outcomes. HKI-SIA engaged the Centre for Quality of Life at the Chinese University of Hong Kong to undertake an exploratory study to examine the feasibility of introducing the valuation methodology to both Hong Kong and Mainland China. 2. SROI and B Impact As﻿sessment Com﻿parative Study: This study assesses the social impact of two work-integration social enterprises using both SROI and B Impact Assessment (an impact evaluation tool advanced by B Lab). The findings of the research will shed light on the complementarities as well as the strengths and weaknesses of these two major impact assessment frameworks in the context of employment creation social enterprises. 3. Use of SROI﻿ as an Enter﻿prise Valuation Tool: This research uses SROI as an enterprise valuation tool in a hypothetical Direct Public Offering (DPO) exercise to raise expansion capital for a social enterprise. Many social enterprises face the challenge of translating its social impact into monetized terms for assessment by potential impact investors. This research aims to broaden the scope of accounting for value using SROI so as to support the development of the social capital market. 4. A Study﻿ to Integrate TEEB and ﻿SROI: TEEB (The Economics of Ecosystems and Biodiversity) is a global initiative focused in examining the economic benefits of biodiversity including the growing cost of biodiversity loss and ecosystem degradation. Through this study, the Institute aims to incorporate TEEB into the SROI framework and examine possible ways of integrating social impact analysis with environmental impact assessment. The key findings of the research projects supported by the SIA Fund will be shared with other researchers and evaluation practitioners through the Institute’s research e-bulletin which will be launched in the second quarter of 2015. The RS Group and the Xu Family Charitable Foundation are the initial funders supporting the establishment of the SIA Fund. RS Group is a family office based in Hong Kong. Its mission is to be a catalytic force in creating a paradigm shift in people’s values and priorities so economic growth does not jeopardize human development and environmental sustainability. A Hong Kong-registered charity, the Xu Family Charitable Foundation is a sister organization of the Beijing-based Yifang Foundation. The two foundations share the common vision in promoting the professionalisation of the charity and not-for-profit sector in China, so as to build social equality and drive social innovation.